Posted 11:05 am by Administrator & filed under News. HPA’s design proposal for the Chicago Architecture Biennial Lakefront Kiosk Competition draws inspiration from the iconic rooftop water tanks that historically dotted Chicago’s skyline. The architectural competition was organized by the Chicago Architecture Biennial in partnership with the Chicago Park District, and is intended to support innovative architectural work while exhibiting the iconic shoreline of Lake Michigan as a laboratory for architectural experimentation. The winning entry will be exhibited in Millennium Park during the Chicago Architecture Biennial (October 2015-January 2016) and relocated to the lakefront during the spring of 2016. 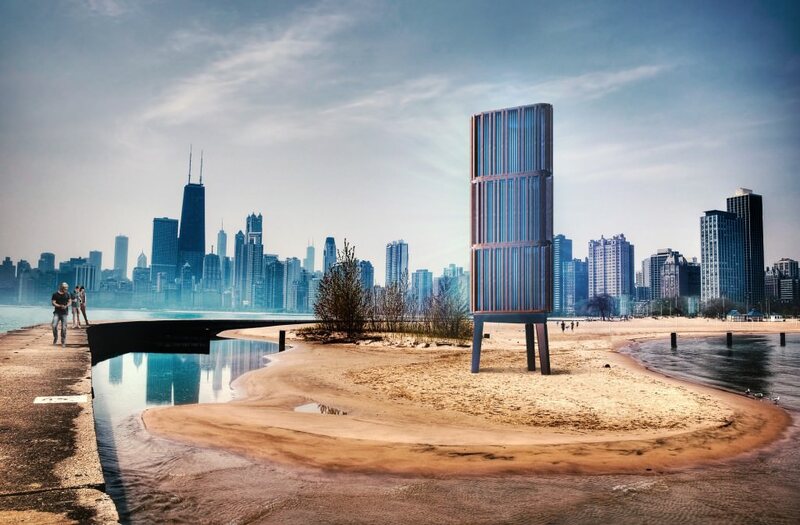 HPA’s kiosk re-contextualizes the water tower as an autonomous figure situated along the lakefront while providing an interactive user experience during and after operating hours. The sculpted tower stands as a beacon, engaging audiences during the day with a dynamic intersection of light and shadow, and at night with a cyan-hued glow that is evocative of water. The flexible design can be reprogrammed for diverse future uses: theatrical or musical performances, a bird sanctuary, lighthouse, water sculpture, or even adapted as a vertical-axis wind turbine. Competition results are scheduled to be announced during the summer of 2015.